Finding land for parks in urban areas such as Downtown Glendale is difficult to find and expensive to purchase. Space 134 takes an innovative approach, creating a Plan to build a 25-acre park over the 134 freeway, which represents the most promising spatial resource for contiguous urban park space in the City. The Space 134 Vision Plan also presents a visionary yet realistic vision for the cap park, one that is far-reaching in its goals to cap the freeway and phased gradually to build momentum and support. It starts with a series of green streets, widened pedestrian rights-of-way on bridges, and pedestrian and bicycle amenities around an innovative “Green Loop” concept. This allows the community to understand the planning principles behind the cap park. Space 134 integrates and supports Glendale's planning goals, including providing multi-modal connections, creating walkable environments, and increasing the availability and adjacency of public recreational spaces. The most direct implementation of City policy is within the Downtown Specific Plan (DSP), which proposed a cap park over the 134 Freeway. 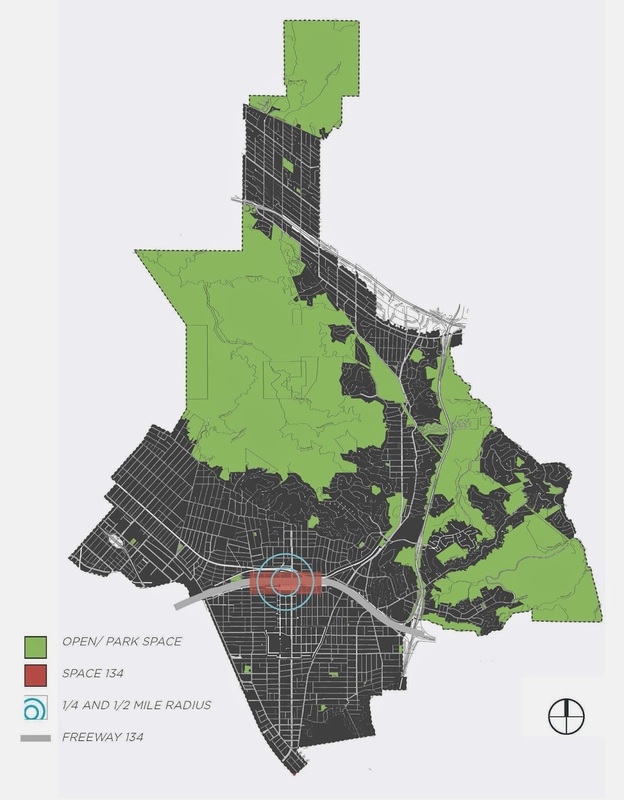 It implements policies in the Greener Glendale Plan by providing accessible open space in underserved areas, using sidewalks, greenways, and streets as green spaces. The Plan also calls for an increase in the sustainability of Glendale, which Space 134 accomplishes through providing permeable surfaces, rainwater capture, wind turbines and solar panels throughout the park. Responding to the Safe & Healthy Streets Plan, the City’s bicycle and pedestrian policy document, Space 134 includes locations for a bike share/station and a bicycle and pedestrian trail network connecting through the cap park into adjacent neighborhoods and increasing pedestrian and bicyclist safety. Space 134 has set a high standard for quality and visionary planning in Glendale and when implemented will improve the quality of life for the City’s residents, employees, and visitors. Effectiveness of Space 134 over time will be measured through indicators that are health related, socially-based (creating better neighborhood connections), and economic (increased property values, occupancy rates, etc.). The project would provide open space amenities in one of the most under-served neighborhoods in the City. The park would help improve air quality through filtration of particulate matter from the freeway, filtration of stormwater runoff, and lowering of temperatures. Space 134 uses an innovative approach to developing both the Vision and Plan; emphasis was on developing the ideas carefully with a dedicated and small interdisciplinary team of urban design consultants, students, and City of Glendale City Staff. Space 134 has the potential to play a key role in the development of Glendale’s urban core. With the cultural and recreational amenities it provides, the park can catalyze new development while sustaining a high quality of life for downtown Glendale.The Space 134 Vision looks at the potential for new open space immediately adjacent to the downtown Glendale core by capping the 134 Freeway between Central Avenue and Glendale Avenue and turning it into a 25-acre public space with active recreational uses, passive open space, event spaces and a regional transportation hub.